When I was young in a car at night in Calgary, I sat on the smooth leather seat, my head resting on the cold window. From the long night out at my Grandparent’s house. I’d watch the sunset sky turn to a dark blue, the streetlights following our car on the highway. Slowly, but surely I could see the bright lights in the sky, stars. When I was young in a car at night in Calgary, the house was far from the city so the stars were much brighter. I believed that each star was a person’s soul and the brighter the star, the kinder the soul. My parent spoke quietly and soft. I can barely hear what they’re saying but I don’t care because the stars were the better part of the journey home. With my headphones on and low music playing, I fell asleep. LEAGUE OF CANADIAN POETS: What inspired you to write “When I Was Young in a Car at Night in Calgary“? 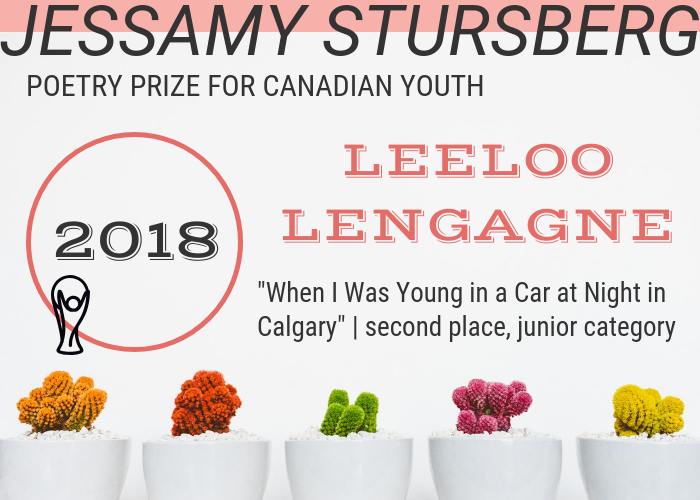 LEELOO LENGAGNE: Originally “When I Was Young in a Car at Night in Calgary” was a writing prompt from school. When I brought it home to alter and edit, because I didn’t have the chance at school, I read it to my mother who always helps with my writing. She seemed to like what I wrote and a day later she found this contest and asked if I wanted to enter my poem. I saw no problem with it so I said yes. LL: My interest in poetry started in second grade because the school wanted us to know the importance of story telling. 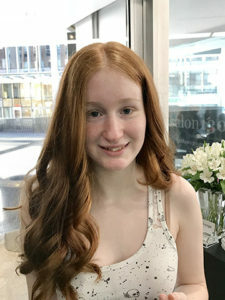 Then, the interest started again last year when I found that writing was a way to express myself that I found a lot easier then talking to someone. LL: Some of my favourite authors are Agatha Christie, Neil Gaiman, Shel Silverstein and Jerry Spinelli. I like authors who write with a somewhat dark atmosphere or ones who really bring the reader into their story. You could be sitting and watching the story play out or you can feel what the narrator/character is feeling. LL: The books I grew up with are ones I still love today but I’m always finding new stories and adventures to get into. Some include Where the Sidewalk Ends by Shel Silverstein, Smile by Raina Telgemeier, The Ocean at the End of the Lane by Neil Gaiman, the Amulet series By Kazu Kibuishi, Murder on the Orient Express by Agatha Christie, Seconds By Bryan Lee O’Malley and Nightmares by Jason Segel and Kirsten Miller. I like reading a lot and I like to see how different authors choose to tell their stories. Reading has inspired me to write stories and helps me relax after a long, stressful day at school. LL: I see writing as a way to disappear from reality and create a new world, even if it’s for a small period of time. So for now and in the future I see it as a coping mechanism for my anxiety. LL: My advice for other students would be to just write and don’t worry about editing or changing anything at first. Just write your ideas out, read it over and edit it later. Writing is a step by step kind of project, not an obstacle you can tackle all at once. LL: My favourite thing about poetry is that it’s expressive and all depends on the writer. Not in the sense that the writer must be perfect; it’s more important what the reader gets from the poem. It can be simple and powerful or complex and emotional. I find that when you’re in the right mindset you can make something incredible and enjoyable for your audience and, more in importantly, for you as a writer.